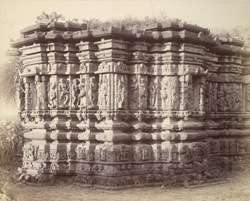 Photograph of the Lakshmi Narayana Temple at Pedgaon, taken by Henry Cousens in the 1880s. The town of Pedgaon was an important Islamic settlement demonstrated by the the fort and many of the buildings that can be found there. The many temples show that there was also a strong Hindu element living there too. The Lakshmi Narayana stands on the bank of the river Bhima about eight miles south of Srigonda in Ahmadnagar district. It is dedicated to Vishnu, faces west and is richly decorated on both the inside and the outside. The outer walls are covered with sculpures and on the basement mouldings there are friezes with horses, elephants and men. The hall has three porches and is enclosed by peforated screen walls which allows light into the interior. The pillars are of an unusual type and are also heavily decorated. The shikara or tower was made of brick but has now mainly fallen down.